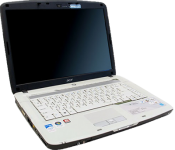 Acer’s Aspire 4000 notebooks provide the user with the best value for their money. The slim and sleek design and mobility make them the perfect replacement for a desktop computer. Its comfortable keyboard and ideally placed output ports make it user-friendly and convenient. A memory boost will make your notebook’s memory intensive application work smoother.